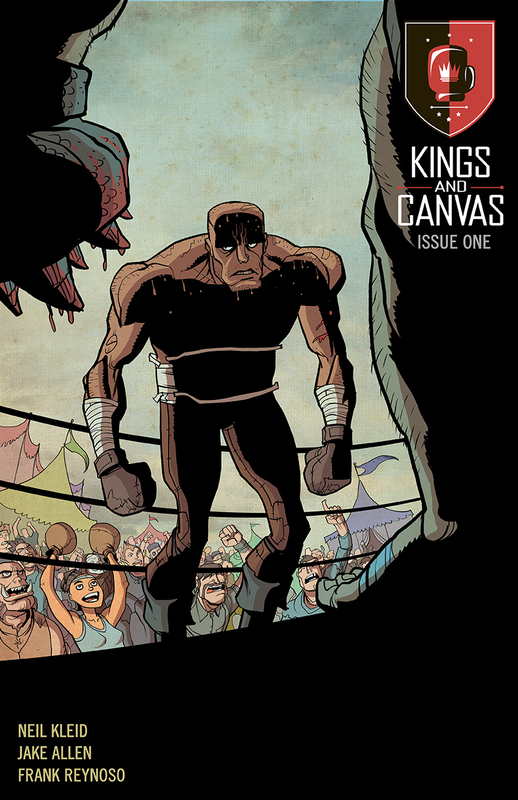 In the world of Monkeybrain Comics’ Kings and Canvas, boxing is no mere pastime; it’s more a way of life. The sweet science informs and impacts virtually every facet of society. Everything from the negotiation of a business transaction to a slight against one’s honour could potentially lead to the ring. 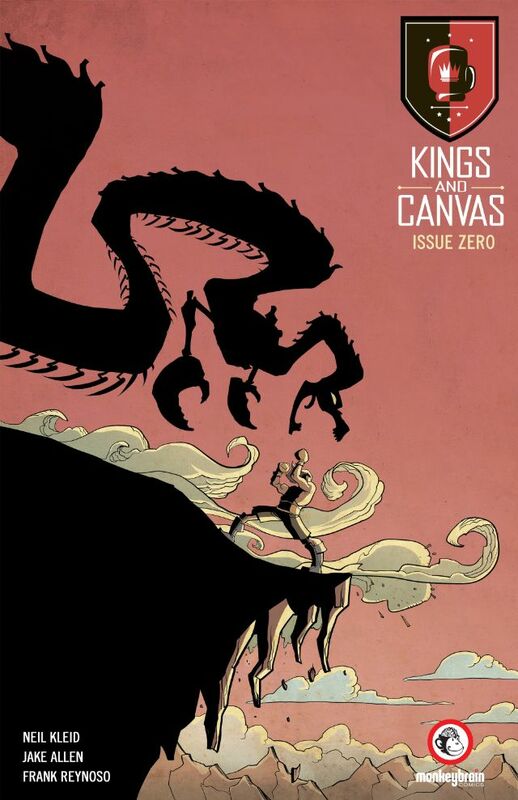 Following the quest of the renegade former champion known as Mammoth as he journeys across an America where magic and boxing hold sway in about equal measures, Kings and Canvas is about as original a hook for a comic book as you’re going to find. 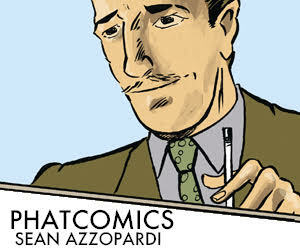 In fact, we found it so original we reached out to writer and co-creator Neil Kleid (Brownsville) about the inspiration for the series and the creative synergy he shares with artists Jake Allen (Brownsville) and Frank Reynoso (Occupy Comics). Kleid’s core premise fuses high fantasy fiction in the vein of George R.R. Martin’s A Song of Ice and Fire or Patrick Rothfuss’ The Kingkiller Chronicle, with the storied martial art of pugilism. “I wanted to build a world, create an epic of my own and imagine what might happen if my aging warrior had been removed from it for ten years, and then was thrust back in and forced to reinvent himself…or simply find purpose. The feudal setting of Kings and Canvas is one of the series’ most intriguing and attractive features. 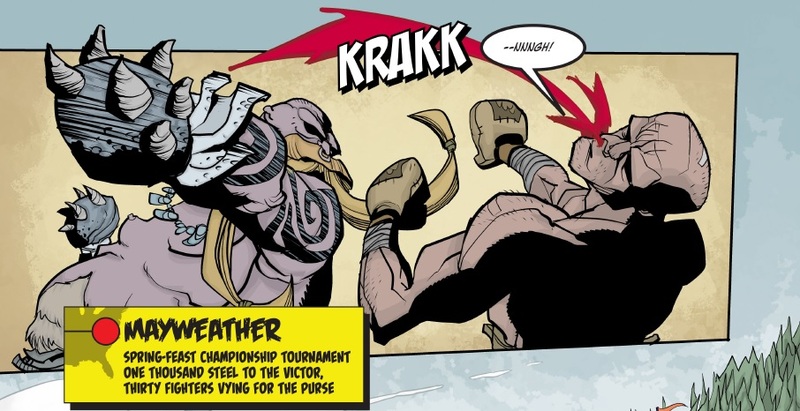 Mammoth’s America a tiered realm of competing territories, structured along the lines of a round robin tournament or a hierarchy of boxing circuits. Boxing provides the rule of law in this alternate America but it’s far from the realm’s only fascinating quality. Mammoth’s America is a place full of magic and whimsy, where exiled sentinel dwarves secure the remnants of St. Louis and talking, bi-pedal tigers ferries passengers and goods up and down the River Purgatory. So far we’ve only heard snippets of its rich history, but the setting’s vibrant people and exotic locales paint a wonderful picture of Mammoth’s strange homeland. 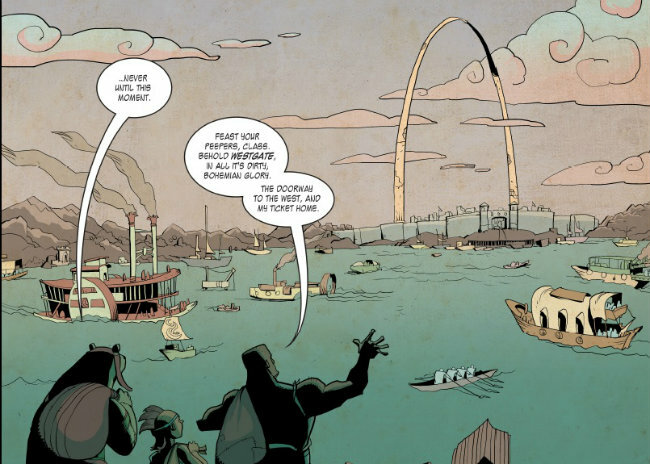 As Kleid notes, “This is clearly a different America than the one we’re used to… but remnants can be seen (like when our heroes travel to Westgate in issue #2 and are greeted by the St Louis Arch as the gateway to the West). These guys don’t just have your back – they have the cure for what ails you. Such a strong premise requires an equally strong creative team, willing to set aside their egos for the good of the story. From Kleid’s snappy dialogue and focused character development to Allen and Reynoso’s stunning, panoramic set pieces and kinetic action sequences, it’s evident that this creative team have all bought into Mammoth’s quest wholeheartedly and without reservation. This translates into a supremely fun and engrossing reading experience for their fans. “Striking the right balance is hard for an artistic team, but Jake and Frank manage to make it seamless. I get the inks? Brilliant. I get the colors? Brilliant LEVEL TEN. I’m truly honoured and humbled to be working with both these talented partners”.